MHWOW allows young adults all around the world create their own Jewish experiences, but we know it’s not always sunshine and rainbows. In honor of Passover we are addressing the ten plagues of being an MHWOW host, a.k.a. the ten obstacles that most frequently come up, and how to overcome each one. So sit back and recline at your seder table, and let us make your job just a little easier this holiday season! Oh, my wallet seconds that! My MHWOW programs are almost always potluck. Aside from my guests being able to showcase their own cooking, my chefs in training (aka my friends) are given a budget to spend if they would like to subsidize the cost of their noodle kugel. After the Shabbat dinner or Rosh Chodesh gathering, I submit everyone’s receipts and reimburse my friends after I get the $$$ back. I ran the numbers and I average $120 for 12 people per program, but for my two programs that took place in March I am just out about $60 because my friends offered to make purchases for the programs. I hate when my friends have to cancel last minute. Although I never want them to show up if they are sick, I want to do my best to ensure they are accountable to be there if they told me they would. Most of my programs are hosted with two or three friends so more of us are responsible for all of the things we need to do to make it happen. Most recently, I planned a Shabbat dinner with my friends, Joe and Elyse. 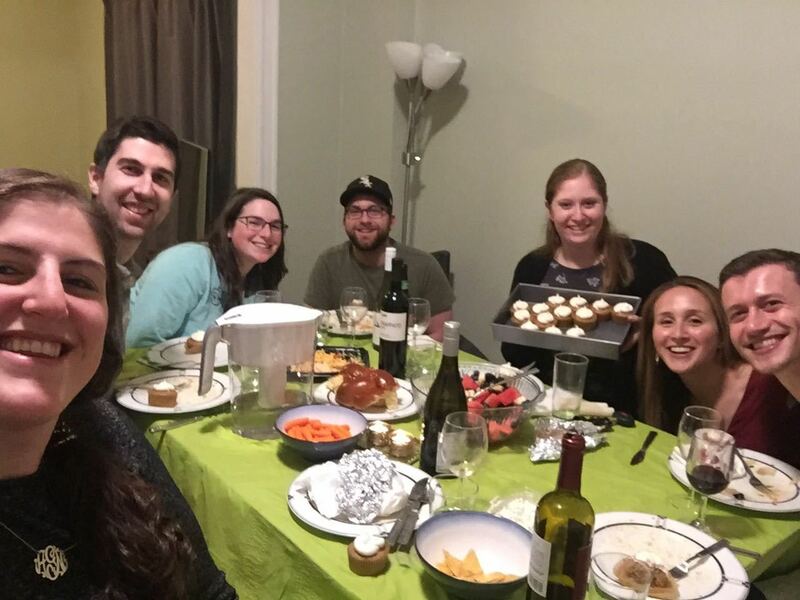 Joe offered his house and to make the main course, Elyse prepared desserts and followed up with our friends to make sure everyone who said they would show actually did, and I led the Shabbat blessings and prepared a discussion about Tikkun Olam. We all have different networks of people and since we could all go to our closest friends and say, “I am planning a big part of this can you please support me and show up?” we saw each committed attendee! All good things must come to an end, including our time as MHWOW hosts. We don’t want this to mean the end of you and your friends doing Jewish things together. Your friends are able to become MHWOW hosts! All they need to do is attend one of our Jewish learning retreats. Agree to go on a retreat together and let’s get your pal set up to be a community builder too. Check out our schedule of retreats here and let your MHWOW staff person know if you two want to join us! My favorite part of this job (I think I speak for the whole team, actually) is when I get to work one on one with hosts to create new programs. Use your MHWOW staff member to help reignite your program ideas. We’d love for you to tell us what your passions and hobbies are, we will bring the Jewish content, and together we will make some MHWOW magic! 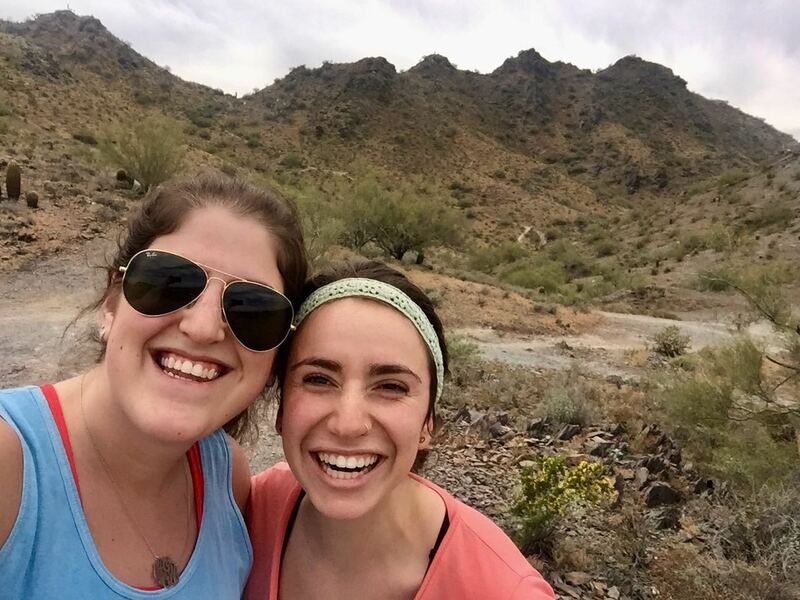 Brandon out in Phoenix reached out to me about an idea to start a poker group to keep his Jewish friend group from college together, I worked with him to infuse Tikkun Olam components, and voila we have a stellar MHWOW program! This quarterly gathering requires every player to pitch a charity that they are passionate about to the group and the winner at the end of the night donates the winnings to the charity of their choosing, whether it be the one they had in mind or the suggestion of another player. Don’t know who your staff person is? Email us! We all have a million things on our plate, but the beauty of MHWOW is that it forces you to unwind and take a break from it all. While it’s work to plan programs, it should be an opportunity for you to hit pause and spend time with your community. A small, four person gathering can be regenerative and meaningful! An intimate Shabbat dinner with three friends or a challah bake with your neighbors is so easy to put together and gives you the relaxation we all deserve. If you want a crash course in taking time for yourself, definitely join me at Community Starts with You next month! I certainly don’t have the space in my home to gather my friends together as often as I would like. By changing up the locations of programs, my community gets to do things together we probably wouldn’t otherwise. 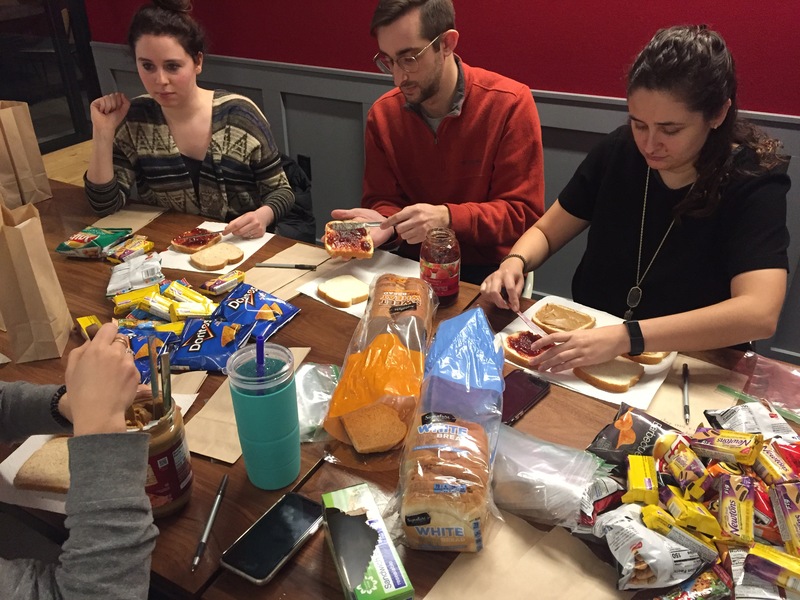 Shabbat picnics in the park, free-to-book spaces at the local library, public museum, or community center, and Tikkun Olam projects in my office building have allowed me to host as much as I want without cramming people into an unreasonably small space or making them schlep way too far. What spaces outside of your home would be a great place to gather friends? Your programs don’t have to be exclusively for Jewish people. Have you checked out MHWOW host Allyson Zacharoff’s article about how to host interfaith programs? You can also be hosting programs so that you can practice your faith and teach your community about what rituals are important to you. 10. This is the one we don’t know about yet! If there is an obstacle getting in your way of thriving as a MHWOW host, we want to know about it. Reach out to us over email, phone, or carrier pigeon and let us know what’s up. By looping in your MHWOW staff member, we can help you break down these barriers so that you can continue to be successful. 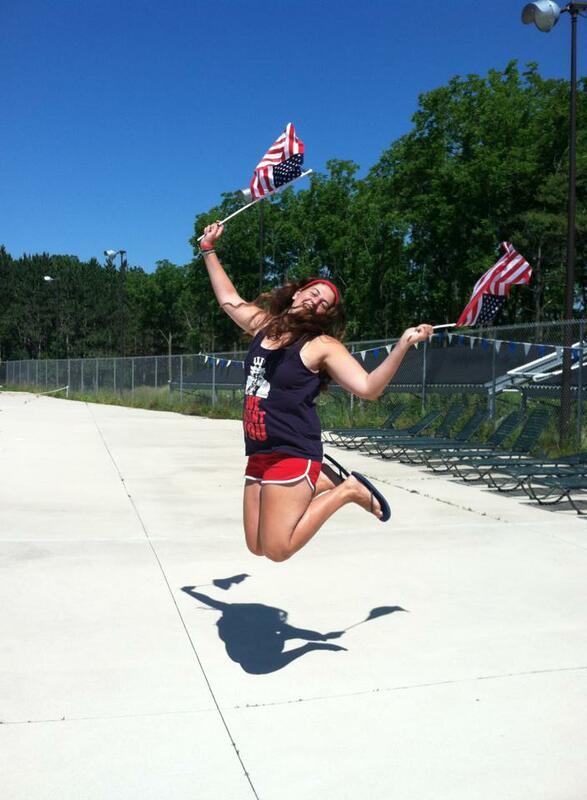 Seriously, I am your number one fan, personal cheerleader (see my sad attempt at cheering below), Jewish mom-in-training, and personal Ted Talk speaker so if you ever need to pick my brain you know where to find me. Happy hosting!